Sadly, President John F. Kennedy did not live to experience the positive emotional and geopolitical outcomes of his decision to challenge the country to go to the Moon. The tragic events of November 22, 1963, prevented this well-deserved honor. Kennedy, and President Eisenhower before him, recognized that international leadership in space capabilities provided critical leverage in the conduct of foreign and defense policy during the most intense stages of the Cold War. After the Soviet Union’s October 1957 success with Sputnik-1, Eisenhower’s quiet implementation of national space policy laid essential foundations for what would follow. In the first few months of the Kennedy Administration, the new President rapidly assimilated both the status of Soviet intentions for space dominance and the growing potential for the U.S. to counter those intentions. President Kennedy’s ultimate decision to send Americans to the Moon built on many technological advancements and events. The Wright Brothers’ successful aircraft flight on December 17, 1903, at Kitty Hawk, North Carolina, and its demonstration of American ingenuity, provided the first link in the chain that led directly to the Apollo Program for “landing a man on the Moon” in 1969. Rapid advancement of early aviation prior to and during World War I led Congress to create the National Advisory Committee on Aeronautics (NACA), signed into law by President Wilson on March 3, 1915. The work of the NACA and the military services began to accelerate the country’s advancement in aviation. Rocket technology began its march toward the future with the successful launch of a small liquid-fueled rocket by Robert Goddard on March 16, 1926, near Auburn, Massachusetts. Although neglected in the U.S. for the next 20 years, wartime liquid-fueled rocket technology advanced in Germany, led by Wernher von Braun, with the development of the V-2 missile. In the summer of 1945, with Eisenhower as Supreme Commander in Europe, von Braun and many of his engineers surrendered to the U.S. Army. As the Cold War loomed on the horizon, the von Braun team became part of the Army Ballistic Missile Agency. All through World War II and the Cold War period, the development of defense-related electronics proceeded apace. In addition, major aircraft and defense companies and laboratories continued to advance their capabilities to manage and execute complex engineering endeavors. On October 4, 1957, with the success of Sputnik-1 the first artificial satellite of Earth, the pace of foundational events moved rapidly forward toward Kennedy’s rendezvous with the Moon. The continued disappointment of the Navy’s Vanguard rocket to orbit a satellite during the highly visible International Geophysical Year led Eisenhower to turn to the Army for a response to Sputnik. After an 84-day crash effort, the Army launched the Explorer 1 satellite on a modified Jupiter ballistic missile on January 31, 1958. By October 1958, President Eisenhower and the bipartisan congressional leadership of Lyndon Johnson, John McCormack, and Tiger Teague had created NASA by joining the NACA with the Army’s Jet Propulsion Laboratory and Ballistic Missile Agency. All agreed that NASA should be a fully visible, civilian agency. T. Keith Glennan of the Case Institute and Hugh Dryden of the former NACA were chosen as leaders of the new Space Agency. Glennan soon created the Space Task Group to study human spaceflight under the leadership of Robert Gilruth and other veterans of the NACA. Their experience with managing complex projects would be fundamental to future success in space flight. Building on the complex and highly successful X-15 Rocket Plane project, Gilruth’s Space Task Group began to work on Project Mercury in January 1959 with the goal of putting Americans in Earth-orbit. 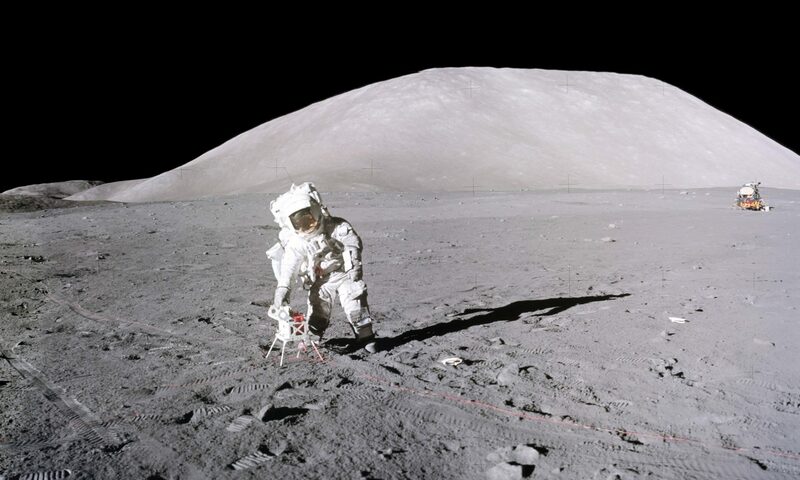 During the same period, lunar mission concept and design studies were underway both in NASA, under George Low’s leadership, and by several future industrial contractors. Soon after opening its doors, NASA had assumed responsibility from the Air Force for the development of the huge, 1.5 million pound thrust F-1 rocket engine. Next, on January 14, 1960, sixteen months before Kennedy’s Moon landing decision, Eisenhower personally directed Glennan to “accelerate the super booster program”. This program evolved into the Saturn V Moon rocket with five F-1 engines as the mainstay of its first stage. As Kennedy prepared to take office in January 1961, Glennan formalized a Manned Lunar Task Force under George Low. In addition, Vice-President Johnson continued as a major advocate for aggressive space policy within the new Administration. Then, NASA received another outstanding leader when Kennedy appointed former Bureau of the Budget head James Webb as Administrator. In rapid fire, events in April and May 1961 led up to JFK’s decision on the Moon: Yuri Gagarin launched from Baikonur Cosmodrome in Kazakhstan and orbited the Earth in Vostok-1 on April 12th. Five days later, the Bay of Pigs fiasco began. On April 20, Kennedy asked Johnson “Is there any…space program which promises dramatic results in which we could win?” This triggered a weeklong multi-agency review headed by the Vice-President. Within the fallout from the Bay of Pigs, Kennedy held a press conference on April 21st during which he said, “If we can get to the Moon before the Russians, then we should.” On April 28th, Johnson submitted a report to Kennedy in answer to his earlier question, concluding “…with a strong effort, the United States could conceivably be first in [circumnavigation of the Moon and also in a manned trip to the Moon] by 1966 or 1967.” The month concluded with Vice-President Johnson forcing an agreement between Webb and a reluctant Science Advisor, Jerome Wiesner, that a national goal should be a Moon landing. On May 3rd, Webb briefed Johnson on the feasibility of a Moon landing, based on the work of the Low and Gilruth teams and von Braun’s progress with development of “the super booster”. On May 5th, Mercury Astronaut Alan Shepard, aboard Freedom 7, became the first American in space. The next day, Webb and Defense Secretary Robert McNamara agreed that NASA should lead the Moon effort rather than it being a classified, military project. The following day, May 7th, Administrator Webb presented a draft Decision Memorandum that the President accepted without change. Soon after, on May 25th, 1961, President John F. Kennedy addressed a joint session of Congress and proposed the goal of landing a man on the Moon. Young Americans achieved Kennedy’s goal on July 20, 1969, when the Eagle landed and Neil Armstrong became the first person to set foot on the Moon.